A clean CV template filled out for a social worker - a great example of how to prepare your CV if you are seeking a social worker position. The template uses classic Arial Black and Arial as a font to ensure your information is presented neatly and in a way that can be easily read by prospective employers. The info is divided into two columns, with your personal information such as name and contact details on the left, and your work experience and qualifications on the right. Résumé example for a social worker or similar role	Overall rating:	4	out of 5 based on 2	reviews. If you're applying for a social worker role, this CV or résumé template is the perfect place to start. 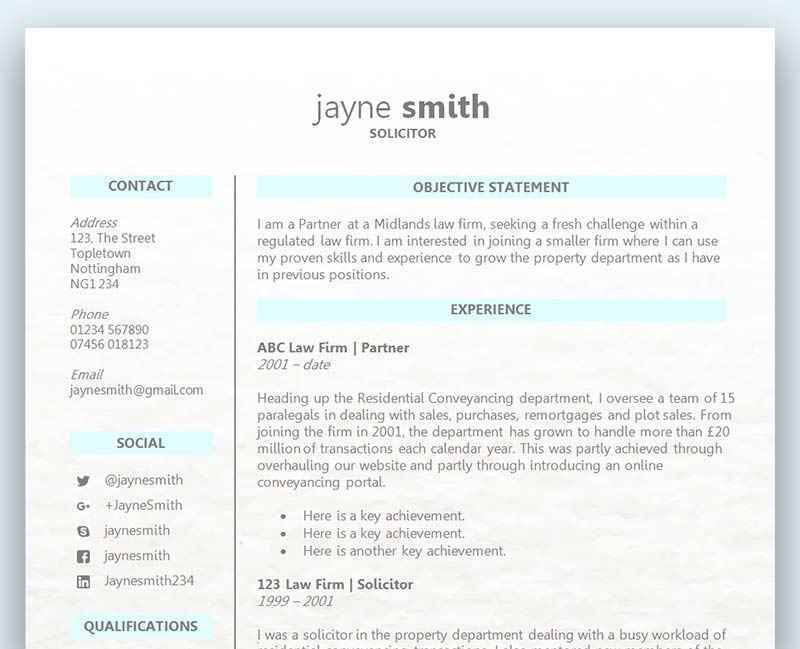 Not only does it have a nice clean layout that's easy to customise with your own information, but it also contains all the inspiration you need to help fill out your own details. Particularly relevant to a social worker role, this CV example has a 'skills' section on the second page where you can fill in particular training you've completed or certificates that you've achieved in your work. There's also a good sized objective section at the top of the first page where you can give a summary of who you are, what you're looking for and your main achievements. This section is the best place to summarise the skills and experience you have which directly match those that your prospective employer has detailed in their job description - think of it like your sales pitch! Most of us will only ever write one CV in our lifetime and then simply update it after each job. Unfortunately this isn’t going to impress a new employer and it’s important to realise that a CV should require much more of your time when it comes to applying for another job. It’s the hiring manager’s job to sort through the huge pile of CV’s that land on his or her desk (or via e-mail if it’s not the 1960’s lol), and create a ‘possible interview’ pile. If you have a CV that hasn’t changed since you started work 10 years ago, it’s obviously going to show its age and won’t do you any favours. The hiring manager wants to read a CV that perfectly shows how well suited you are to the role, and if they have to read between the lines it’s probably likely that you’ll end up on the ‘no’ pile. A generic CV is very easy to spot and will fail to create a great first impression. Sending out a generic CV doesn’t always mean you don’t get an interview, but when you are very likely up against other applicants that have just as many qualifications and skills as you have and they’ve taken the time to tailor their CV to the role, you can clearly see how you are instantly at a disadvantage. A custom written CV shows that you are passionate about the role and the company, and that you have clearly listened to what they were asking for. It also shows you are hard working and an ‘outside the box’ thinker. If you are willing to put in the extra time to write your CV specifically for a new role, you are clearly the kind of person they are looking for. The whole idea behind custom writing a CV to a specific role is to show how you are on the same page as the employer, and what better way to do that than by using their own keywords from the job advert itself. For more information on what keywords are and how to use them in your CV – please click here. I would just like to thank you for this example CV which has been a great help to me. All the best. Excellent to have a variety of CV for different industries!